This genus includes more than a thousand species from Central America, especially Mexico and Guatemala. 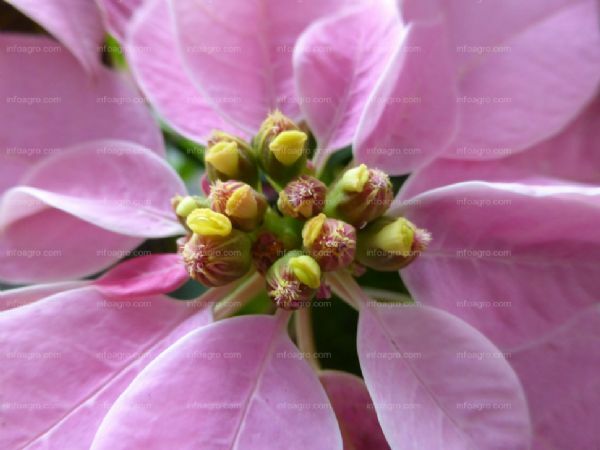 The best known species is Euphorbia pucherrima, noted for its beauty. 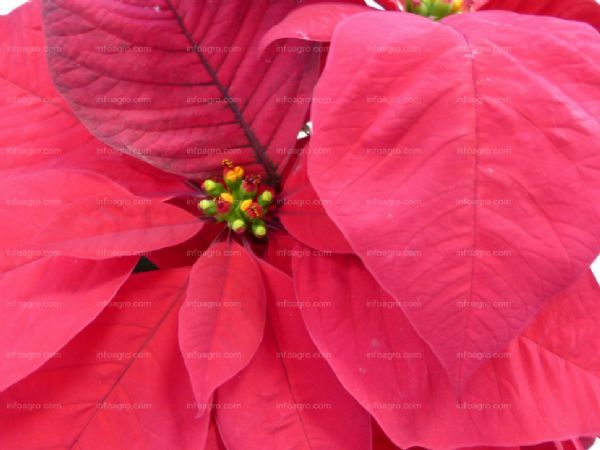 Poinsettia is a shrubby and short-day plant which can reach a height of 3m. 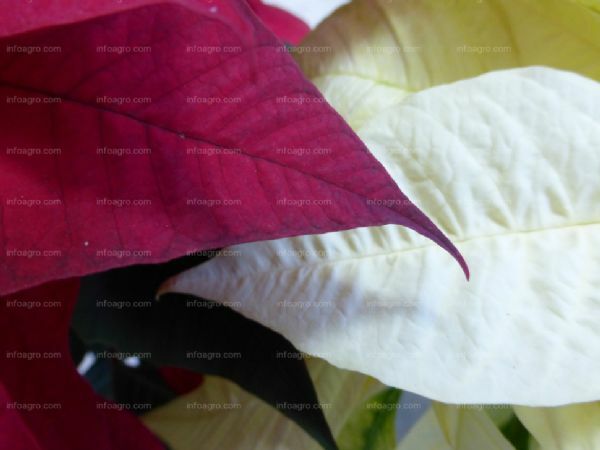 - Leaves: Poinsettia has opposite petiolate and dark green leaves with serrated edge. It is very common to confuse its leaves with its bracts. The bracts are developed at the end of the branches surrounding the inflorescences. They have the peculiarity of bright colours. Depending on the variety, they can be red, pink, white, ivory, salmon etc., being red, the predominant colour in the market. - Flowers: Flowers are yellow. They are gathered in inflorescences and are formed by numerous male flowers and a single female flower. 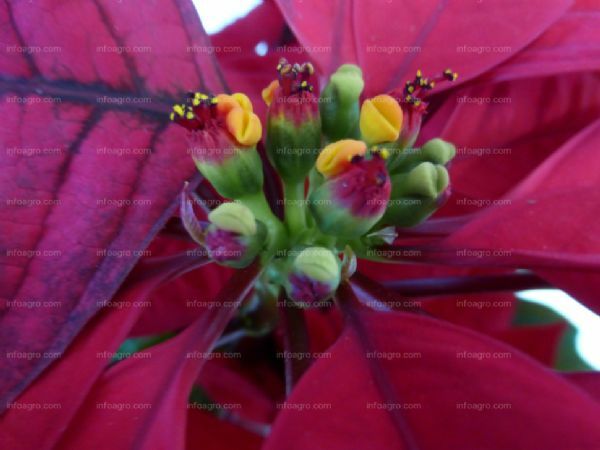 The inflorescences of poinsettia have no commercial value. The development of inflorescence and bract coloration may occur within 2-3 months, depending on the variety. The classification of varieties is performed based on the colour of the bracts, time to flower induction and behaviour in minimum temperatures. Another possible classification is: 1) Standard (uniflora with large bracts) and 2) Multifloras (higher branching capacity than uniflora). The new varieties are obtained by mutagenesis or by hybridization. The lifetime of these plants, once installed at home, is higher. - Temperature: The optimum temperature for vegetative growth of the plant is between 22-25�C during the day, and between 18-20�C overnight. During the flowering period, the temperature should be around 18�C in order to enhance optimal bract coloration. Critical temperatures that affect vegetative growth: Temperatures below 10�C can produce the death of the plant. Below 16�C, the vegetative growth slows down and the plant begins to show chlorosis. Above 35�C the plant is chlorotic, growth slows down, the stems are thinner and the leaves are smaller. Critical temperatures that affect flowering: A very high temperature during this period is harmful for flowering. Below 24�C, the floral development is delayed. However, once the bracts are fully developed, low temperatures favours good colouration. - Humidity: The relative humidity should be below 75%. To control humidity, proper aeration must be maintained. Thus, incidences of Botrytis cinerea and Erwinia sp., as well as excessive elongation of plants are prevented. 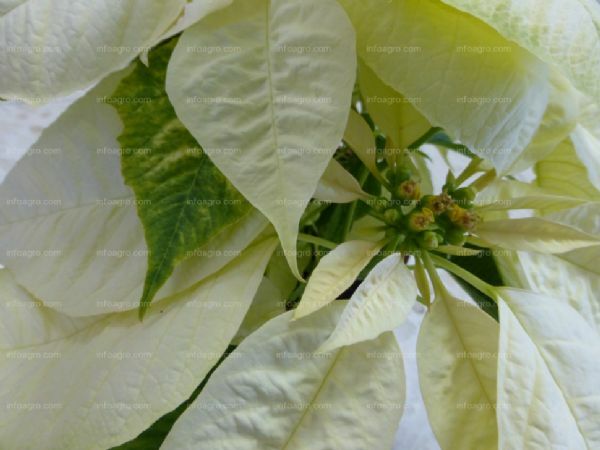 - Light: The poinsettia is a short-day plant. It needs a period of uninterrupted darkness of 12.5 hours for the formation of floral meristem. Otherwise, only the vegetative meristem will be developed. The light level that this plant can support is variable, provided that it is acclimated. However, the most common is to produce 30000-40000 lux. 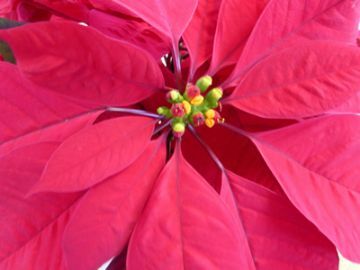 Currently, poinsettia can be grown throughout the year due to the production of technically directed crops and the existence of numerous varieties. - Substrate: The substrate must be porous, with adequate water retention, good drainage, and high cation exchange capacity and free of disease, since this plant is very susceptible to root diseases. Substrate pH should be between 5.8 and 6.2. A suitable and simple substrate is the mixture of thick peat and vermiculite in a ratio of 2:1. - Watering: During flowering, watering should be more frequent but waterlogging should be avoided. After the fall of the flower, reduce watering frequency. 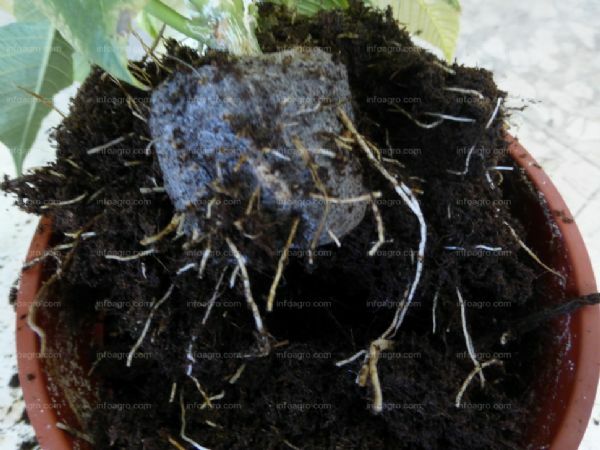 It is important to keep track daily the condition of the roots and irrigate it depending on their state. If the root hairs have a white and transparent colour, it means they need water. On the contrary, if they have a relatively dark colour, the plant does not need to be watered yet. The water temperature should be between 22-24�C because cold water blocks the root system. 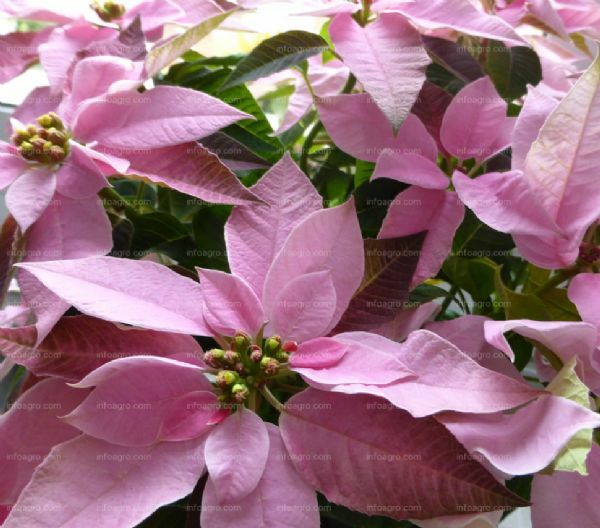 The propagation of commercial varieties of poinsettia is from 6-8cm length cuttings. These cuttings can be placed directly into individual pots with porous substrate and with good water holding capacity, pH of 5.8 to 6.3 and free of pathogens. For proper rooting development, it is convenient to use IBA rooting hormone (Indoli-3-butyric acid) or NA (naphthylacetic acid). Within 8-10 days, a callus tissue begins to form at the base of the stem. During this period, fogging frequency should be increased and temperatures of about 20-22�C during the night and 22-24�C during the day. This phase requires plenty of diffused light. 10-14 days after, the growth of the root system begins. At this stage, the intensity of scattered light should be increased and the temperature should be reduced. It is convenient to fertilize the cuttings. At 21 days from the start of rooting, the relative humidity must be reduced and the light intensity must be increased. - Potting: Each plant should be placed in a pot. For potted plants, unifloras of 9-12cm in diameter is normally used, while for Multifloras plants 14-16cm. - Settings for plantation: The setting depends on the size of the pot. - Pinching: With pinching, the growth of lateral buds that give flowers is induced, so that this technique should be done depending on the desired number of bracts. This technique is done by cutting the apical meristem and leaving many leaves and lateral buds as desired. It is advised not to make a pinch too high (the normal way is to leave three to five leaves). The first pinch should be done when the plant has young buds (about 10 days after planting). The date of pinching conditions the quality of the plant. If pinching is done early, the size of the plant is excessive. However, if it is done late, plant development is insufficient. - Height Control: One way to control the height of the plant is through the use of growth inhibitors. Growth inhibitors reduce cell division and elongation in the sub-apical meristem, ie, reduce the size of the plant. They can be applied via fertigation or foliar application (at temperatures below 25�C). The doses depend on the contents of the product. An overdose can cause shrinkage of the bracts, chlorosis, curl and leaf spots. Another way to control the height is through the DIF effect (temperature difference between day and night). The growth is positive when the days are warmer than nights. By contrast, growth is negative when the nights are warmer than days. Therefore, to reduce growth, reduce diurnal temperature of about 2.5-5�C lesser than night temperature. - Management of photoperiod: Management of photoperiod depends on the length of the days. Management in long-day period: During the floral induction, darkness should be provided. To achieve this, black meshes are used. These meshes are to be placed, preferably in the afternoon (about 6 pm) and a minimum height of 1m. Thus, excessive heat within the greenhouse is prevented and good aeration is guaranteed. It is advisable to cover with meshes the greenhouse from six in the evening until seven o'clock in the morning of the following day. Management in short-day period: During vegetative growth, providing additional light is required. Incandescent or fluorescent lamps are typically used. 100W Fluorescent lamps should be placed every 1.7m and 1.2m above the plants. Incandescent lamps are typically 60W and should be placed every 1.2m and 0.6m above the plants. The input of light should be performed every 4 hours and preferably between ten at night and two in the morning. 1. Start of the cycle: Planting of cuttings in January. 2. Potting: The potting is done at the time of reception of cuttings. 3. Pinching: Approximately 10 days after potting. 4. Light input: It is done from January to early May. 5. Darkness input: It is done in early March. The end of this stage corresponds to the full development of the bracts. 6. Flowering: In early May. 1. Start of the cycle: Planting of cuttings in May. 4. Light input: Not required. 5. Darkness input: It is done from June until the bracts are fully developed. 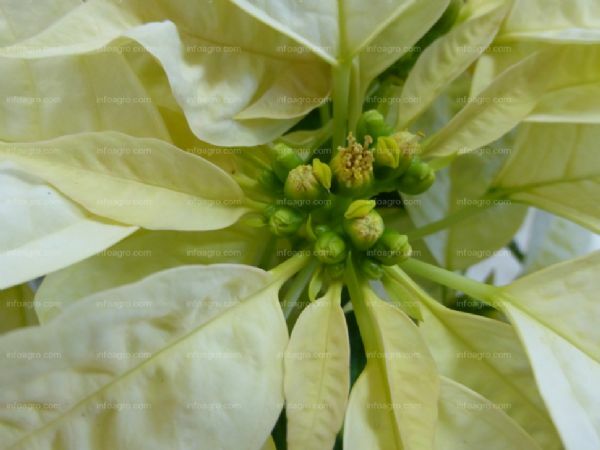 To sell poinsettia in early December, the beginning of the cycle must be in August. Light and darkness inputs are not necessary. - Fertilization: Fertilization should be stable and maintained until the sale in order to avoid discolouration and size reduction of the bracts. It is performed at a rate of about 150ppm of fertilizer and a balance of 1: 0.5: 1. Micronutrients must be provided because molybdenum and zinc deficiencies are frequent. Once completed the development of the bracts, fertilization should be stopped. Foliar fertilizers are suitable when the root system poorly absorb nutrients. However, these should not be applied when the bracts are beginning to change in colour. - Whitefly (Bemisia tabaci and Trialeurodes vaporariorum): Depending on the production area, a particular species of whitefly appears. It occurs primarily when the temperatures reach 25�C. The symptoms are yellow spots and wilting of leaves. To avoid/prevent severe whitefly attack, yellow chromotropic traps should be placed on the plants. When the first whitefly appears, it is recommended to use biological control. To control Bemisia tabaco, it is done the release of Eretmoderus mundus and for Trialeurodes vaporariorum, the release of Encarsia formosa. Amblyseius swirskii is efficient both for T. vaporariorum and for B. tabaci. When the incidence is greater, it will be necessary to resort to chemical treatment with plant protection products compatible with the auxiliary fauna. - Thrips (Frankliniella occidentalis): produce significant damage when the population is high. Symptoms that occur in the leaves are whitish spots of a typical silver-lead-appearance usually surrounded by black specks corresponding to their wastes. For biological control of thrips, Amblyseius swirskii can be used, in addition to being a great predator of whitefly. - Mealybugs: The symptoms are small brownish-red spots on the undersides of the leaves. This pest also secretes a sweet substance, in which the sooty mould is installed. To control this pest, it can be used a systemic insecticide that does not stain the bracts of the plant and can be compatible with the auxiliary fauna being used. - Aphids: These insects are installed on the underside of leaves. Symptoms are yellow spots at points of pitting, curled and deformed leaves. They also secrete a sugary substance where black moulds appear. If the attack is severe, chemical control can be used with products that respect the auxiliary fauna. - Rhizoctonia solani: It develops in dry conditions and warm atmosphere. The symptoms are alterations in stem and root. - Pythium ultimum: The incidence of the fungus begins at ground level and is propagated along the trunk causing rot of tissue. - Thielaviopsis basicola: This fungus causes rotting of the root system and therefore the plants turn yellow and wilt. These fungi are present in the soil and affect the root system. Control can be done by preventive treatment (disinfection of substrate and pruning tools, healthy plant material, irrigation water free of pathogens, etc.). When the incidence is severe, chemical control is used. - Oidium: This disease predominates in dry environment. White spots appear on the upper leaf surface, which later turn into a yellowish colour. Such necrotic spots extend and cause curling and death of the leaves. On the underside of leaves, it can be observed the presence of white mycelium. As a precaution, plant ventilation is favourable for reducing the possibility of infection, but should be avoided strong wind currents. If the attack is severe, one must resort to the use of chemicals such as sulphur fungicide powder. On the other hand, one can also opt for biological control with hyperparasites Ampelomyces quisqualis. Normally this works best combining with a fungicide. - Botrytis cinerea: Symptoms are easily identifiable in the field by its gray and hairy sporulation on the upper side of the leaf. The control of this fungus is very important because of its ability to survive as a saprophyte. Excessive moisture should be avoided, either by decreasing the dose and frequency of irrigation and plant spacing or venting. It is also advisable to remove diseased tissue, cutting flush with stem and using disinfected tools. If the attack is severe, chemical control should be used. It is recommended the alternate use of different systemic groups of authorized products. - Erwinia sp. and Corynebacterium sp. : for its control, the removal of diseased plants is recommended to conduct a proper crop management (fertilization, irrigation, etc.) and perform preventive treatments with copper based products and antibiotics. - Chlorosis on leaves: This symptom may be due to the presence of high drafts. - Discoloured leaves and bracts: This symptom can be caused by overwatering. - Accelerated growth of tissues: it is due to the presence of high humidity and insufficient ventilation. - Bracts burns: It is due to nutrient imbalances. - Leaf fall: It can be due to root rot, excessive fertilization, lack of moisture or lack of lighting. - An excess fertilizer causes dwarfism. In these cases, the leaves turn yellow and its edges acquire a burnt appearance.